Summer weather is now in full swing across most the country, just in the time for Wednesday’s summer solstice. It’s traditionally thought of as the first day of summer, but it’s also the day with the most daylight in the Northern Hemisphere. The 2017 summer solstice happens at 12:24 a.m. Eastern Time on June 21. Below are eight facts about the longest day of the year. 1. What happens on the June solstice? 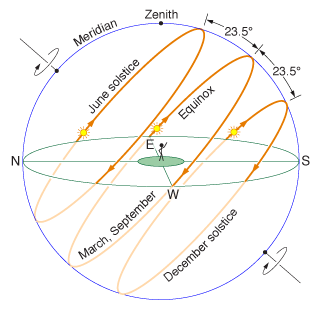 The reason we have solstices, and seasons, is because Earth’s axis of rotation is tilted about 23.5 degrees. This tilt causes each hemisphere to receive different amounts of sunlight throughout the year as our planet orbits the sun. The June solstice occurs when the sun’s direct rays reach their northernmost point with respect to Earth’s equator. At that moment, the sun shines directly overhead along the Tropic of Cancer, at 23.5 degrees north latitude. The word “solstice” comes from the Latin words sol sistere, which means “sun standing still.” To us on Earth, the sun’s daily northward movement in the sky appears to pause before reversing direction. It’s a yearly astronomical turning point that humans have celebrated for centuries, if not millennia (just think Stonehenge or the ancient Maya). 2. How many hours of daylight will I see on the solstice? How much daylight you’ll see depends on your latitude, or distance from the equator. Below are two maps by Alaska-based climatologist Brian Brettschneider showing how daylight hours vary across North America and the Northern Hemisphere. In the Lower 48, daylight on the summer solstice ranges from less than 14 hours in parts of Florida and southern Texas to more than 16 hours across the northern tier. In Washington, D.C., the sun is up for 14 hours and 54 minutes on the solstice. That’s a pretty long day, but it’s nothing compared with Alaska or northern Canada, where the sun is up from 18 to 24 hours. What about the rest of the Northern Hemisphere? For that, check out the map below. Each red circle is a distinct line of latitude and represents a 30-minute increase or decrease in daylight. Cities connected by the same line have the same number of daylight hours. The neat thing about this map is that you can see which countries share the same latitude with the United States. New York, for example, gets about as much daylight as Madrid, which you wouldn’t guess by their differing climates. Meanwhile, several major cities in Europe — such as London, Paris and Berlin — are closer to the North Pole than most of the U.S. Lower 48. That’s why, if you’ve ever visited those places during summer, you may have noticed it stays light well past 10 p.m.
3. Where does the sun rise and set on the summer solstice? Look toward the northeast and northwest. On the June solstice, the sun always rises and sets at its northernmost point on the horizon. That’s true even if you’re in the Southern Hemisphere, where it’s the first day of winter and shortest day of the year. The farther you get from the equator, the closer sunrise and sunset appear due north on a compass. Along and north of the Arctic Circle, the location of sunrise and sunset start to converge in the northern sky until eventually the sun never drops below the horizon. Instead, the sun circles through the sky for 24 hours — referred to as the “midnight sun.” At the same time, the opposite occurs near the South Pole, where the sun never rises or sets and there are 24 hours of darkness. 4. When are sunrise and sunset on the summer solstice where I live? The exact time of sunrise and sunset depends on two things: your latitude and geographic location within your time zone. In Washington, sunrise and sunset on June 21 are at 5:43 a.m. and 8:37 p.m., respectively. Here are two more maps that show the time of sunrise and sunset across North America. Both take into account the effect of time zones and latitude, hence the interesting patchwork of colors. The first map shows sunrise times across North America. In yellow regions — which include Washington and the Mid-Atlantic — sunrise on the solstice occurs between 5:30 a.m. and 6 a.m. In light green regions — which include Chicago, Boston and Seattle — the sun is already up before 5:30 a.m., while in orange-shaded areas sunrise isn’t until after 6 a.m. The next map below shows the time of sunset. Many parts of the Lower 48 see sunset between 8:30 and 9 p.m. on the solstice (gold shading). If you live far enough north or in the western edge of a time zone — for example, most of Michigan, Minnesota and Montana — the sun sets after 9 p.m. (green shading). There are a few spots in the Lower 48, such as North Dakota and Michigan’s Upper Peninsula, where the sun sets after 9:30 p.m.
5. How high does the sun appear in the sky? High enough to recommend sunscreen! The towering height of the summer sun is the main reason is why the UV index is so high this time of year, making it easy to get a quick sunburn. At solar noon on the summer solstice, you’ll cast your shortest shadow of the year, evidence of that high sun angle. But just how high does the sun appear in the sky? Like hours of daylight, it all depends on latitude. Along the Tropic of Cancer (23.5 degrees north latitude), the sun appears at zenith — directly overhead — or 90 degrees above the horizon. As you move farther north, daylight increases, but the sun appears a bit lower in the sky. Want to know the height of the sun at your location on the summer solstice? You can look it up here, but it’s also pretty easy to calculate yourself. If you live north of the Tropic of Cancer (23.5°N latitude), simply subtract your latitude from 90 (degrees) and add 23.5 (degrees). For example, in Washington, D.C. (latitude 39°N), the sun on June 21 reaches a maximum height of 74.5 degrees above the horizon at solar noon (90° — 39° + 23.5° = 74.5°). That’s actually higher than the midday sun along the equator in June. 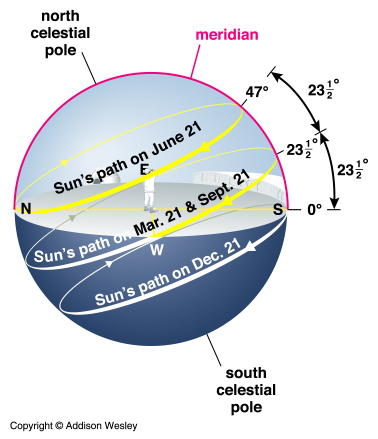 It may seem counterintuitive, but if you live south of the 47th parallel (which is most of the Lower 48 except the far northern tier), the sun always appears higher in the sky on the summer solstice than it does if you’re standing on Earth’s equator. Bottom line: Don’t underestimate the intensity of the sun’s rays this time of year! 6. Is this really the longest twilight of the year? Yes. If you’ve ever noticed that dusk and dawn linger a bit longer around the summer solstice, it’s not your imagination. The summer solstice brings not only the longest day of the year, but also the longest period of morning and evening twilight. But why exactly does the sun’s light fade more slowly? Remember that since the summer solstice is the shortest night of the year, the sun doesn’t drop as far below the horizon. As the sun sets, its path on the celestial sphere slowly curves below the horizon instead of dropping quickly. The shallow angle at which the sun crosses the horizon keeps the sky illuminated a bit longer before sunrise and after sunset. How much daylight is there on the solstice when factoring in dawn and dusk? That depends on how you define twilight. The brightest phase — civil twilight — occurs just before sunrise and after sunset, when the sun is less than 6 degrees below the horizon. If we consider the time from sunrise to sunset and add in civil twilight, most of the United States gets 15 to 17 hours of “usable” light on the solstice. In northern latitudes, twilight can last all night. It’s why even in cities south of the Arctic Circle where the sun technically sets (e.g. Fairbanks, Alaska), it never gets fully dark for several weeks around the solstice. The sun just doesn’t dip far enough below the horizon for there to be full nighttime. 7. Is the solstice the day of the earliest sunrise and latest sunset? Not exactly. June 21 marks the longest daylight period in the Northern Hemisphere. However, the earliest sunrise in many places happens about a week before the summer solstice, while the latest sunset is nearly a week later. 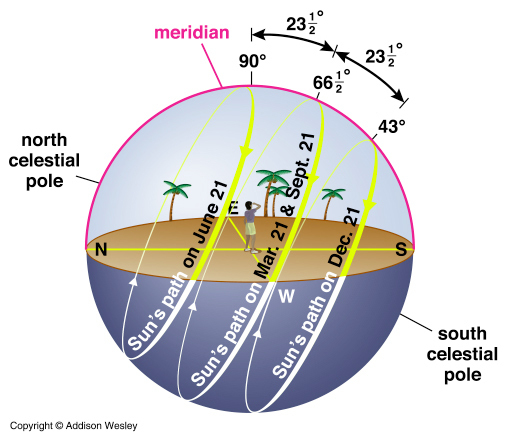 The misalignment is the unique result of the Earth’s 23.5-degree tilt and our elliptical orbit around the sun (read more). Calculated down to the second, the D.C. area’s earliest sunrise (5:42 a.m.) was on June 13. Meanwhile, the latest sunset (8:38 p.m.) isn’t until June 27. The closer you move to the North Pole, the closer the earliest sunrise and latest sunset occur to the solstice, as shown in the map above. 8. Why isn’t the solstice the hottest day of the year? Although the Northern Hemisphere gets its most direct sunlight on the June solstice, the hottest day of summer doesn’t usually hit until July or August. That’s because for several more weeks the amount of solar energy arriving at the ground is greater than the amount leaving the earth. This seasonal lag is largely driven by the oceans, which take a lot longer than land to warm up and cool down and release heat slowly over time. Only after the Northern Hemisphere starts to lose more heat than it gains do temperatures begin to drop. In much of the United States, average summer temperatures peak in mid to late July. However, the desert Southwest feels its hottest days much closer to the solstice, while the warmest days along the West Coast don’t arrive until August (and in some places, even as late as September). Proximity to water and prevailing wind direction are major factors that determine when summer heat peaks. The bottom line: We slowly start to lose daylight after the solstice, but summer is really just getting started. Whether you love summer or can’t stand the heat, the longest day of the year is something to celebrate. Happy solstice!